ESS takes advantage of the principal of physics to achieve better coverage and to lessen the environmental impact by allowing smaller amounts of chemicals to be used. In addition, ESS uses air-assistance to help with spray delivery. Air and liquid enter the atomizing nozzle under pressure. The air moves through the nozzle under pressure and meets the liquid at the nozzle tip, causing the formation of spray droplets that are 30 to 60 microns in diameter. At the tip of the nozzle is a tiny electrode which applies an electrical charge to the spray. The electrical charging causes a natural force of attraction between the spray droplets and target surface. The charge on the droplets, though small, pulls the spray towards the target at 75 times the force of gravity. The spray droplets can reverse direction, moving against gravity, to coat all sides of an object. Click here to read our previous post regarding in-line electrostatic spraying. Air is necessary in electrostatic spraying to create tiny droplets. These droplets are 30-60 microns in size, which is 900 times smaller than conventional sprayers. This allows ESS to give a full coverage to the applied surface whereas conventional sprayers tend to leave side areas untouched. ESS also assures that there is no flooding of the applied surface, no liquid run-off, and no waste. The reduction of chemical and water usage also has a cost impact as significantly less of both commodities provides more rapid return on investment in electrostatic technology. 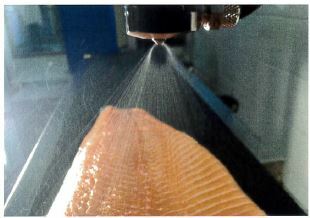 The research and development department at Micreos Food Safety in Wageningen, The Netherlands, has recently conducted tests on salmon using electrostatic spraying on a running conveyor. The salmon samples, both flesh and skin, were contaminated with the Listeria innocua bacteria and placed on a conveyor with the electrostatic sprayer directly above and on the surface of the belt. As the contaminated samples moved along the conveyor, the system sprayed PhageGuard Listex directly on the sample surface. The ESS method allows for a full coverage of the sample surface, even the sides, due to the smaller droplets and natural force of attraction. The samples registered a decrease of up to 99% in the Listeria innocua bacteria after spending 7 seconds on the conveyor. Besides directly spraying on the product surface, the ESS can be used on the conveyor itself before coming into contact with the product, as this allows the product’s unexposed side to be covered as well. A phage concentration of 2% pfu/cm2 at a pickup of 5.2 µL/cm2 was sprayed using an ESS spraying system (pressure- 2 bar; max speed: 9.7 L/h, at 70 cm height) on a running conveyor belt (speed- 27.4 cm/s, width- 19 cm). 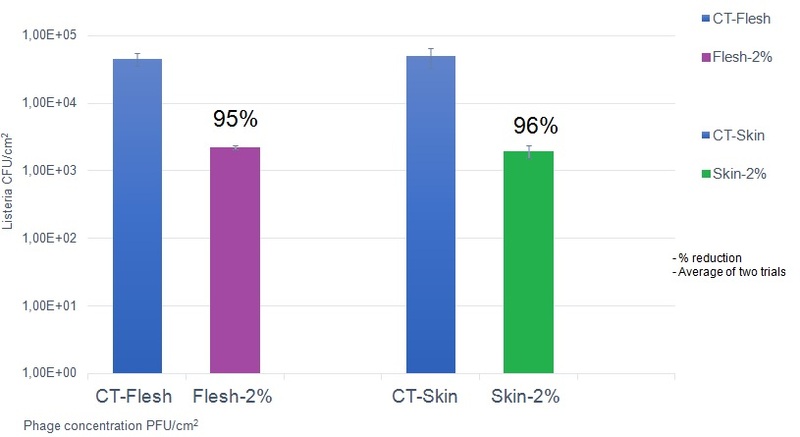 Salmon samples (flesh and skin) were artificially contaminated with L. inoccua, 2×104 CFU/cm2 at 2 µL/cm2 before placing the contaminated side on the belt for 7 seconds. The samples were then stored at 4°C for 24 hrs before enumerating the bacteria. 100 percent natural and organic, PhageGuard Listex is an FDA-approved organic solution that specifically combats Listeria.The PhageGuard advantage is precision. It is targeted to eliminate Listeria in your food products, without affecting taste, odor or texture. 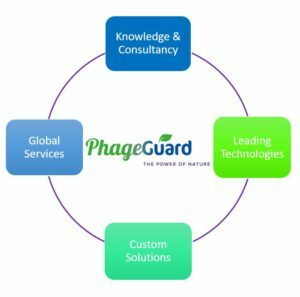 Multiple studies demonstrate the high efficacy of PhageGuard including the Danish Meat Research Institute, the Swiss Federal Institute of Technology Zurich, and the University of Gent, Belgium. Our team can help you with a custom solution! Would you like to understand more about our applications and solutions? Our team offers a full suite of technical support services. Get in touch with us to find out how Micreos can improve consumer safety in your production facilities.